Have you considered why branding on your vehicle is a great way to advertise on the move? Vehicle graphics and wraps are now one of the fastest growing forms of advertising because of their high visibility and versatility as well as being an economical advertising option. It shows who you are and what you do in a flash. So with these in mind, it should be a serious consideration! 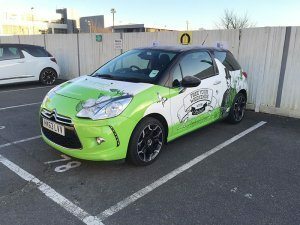 There are so many options available from full and partial car wraps, to vinyl panels – we explain some of your options below. Vehicle wrapping essentially means large sheets of vinyl are used to cover either all, the majority of a vehicle, or any vehicle bodywork. Traditionally used for a van, wrapping is now becoming increasingly popular for all other types of vehicles such as motorbikes, boats and tractors to name a few. They provide a durable surface and can have a digitally printed design or a complete all over colour change. Vehicles aren’t limited to utilising their logo and branding on the conventional panel borders of vehicles but designs can be used to cover all aspects of the body of the vehicle. As a traditional respray job, this option is a more cost effective solution to change the colour of your entire car. Ultimately, you can change your vehicle in order to create an impact – personalising a vehicle instantly and being unique. Surfaces are meticulously cleaned using approved surface preparation products before removing any external parts of the vehicle possible to create a cleaner finish or parts of any vinyl touches the surface of the car. View our car wrapping in fast-mo! Using a self adhesive vinyl, and need a more cost effective option, then using vinyl cut graphics to place branding on parts of your vehicle could be the option for you. 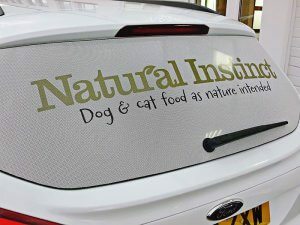 Placed on the windows of your vehicle, you can transform glass with one way vision graphics using a digitally printed perforated mesh. Our print service includes a full colour proofing process. However, if you’re not sure where to start, we also offer a bespoke graphic design service, or we can advise you on how to make best use of your existing vehicle branding. As every design is different, the best way to contact us is over the phone so we can discuss your exact requirements through with you.